Paul's warning to the church! Paul, after visiting the church at Troas and walking to Assos, continues his third missionary journey by sailing on the Aegean Sea toward the port city of Miletus. 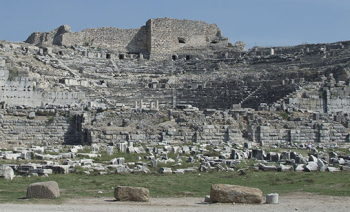 Few events connect the history of Miletus with the transactions of the Roman Empire. When Apostle Paul was there, it was simply one of the second rate seaports on this populous coast, ranking, perhaps, with Adramyttium or Patara, but hardly with Ephesus or Smyrna. The excitement and joy must have been great among the church of Ephesus, when they heard that their honored friend and teacher, to whom they had listened so often in the school of Tyrannus, was in the harbor of Miletus, within the distance of a few miles. The presbyters must have gathered together in all haste to obey the summons, and gone with eager steps out of the southern gate, which leads to Miletus. By those who travel on such an errand, a journey of twenty or thirty miles (32 to 48 kilometers) is not regarded long and tedious. The Ephesian church might easily reach Miletus on the day after that on which the summons was received. And though they might be weary when they arrived, their fatigue would soon be forgotten at the sight of their friend and instructor Paul as God, "comforts them that are cast down" (2Corinthians 7:6). God's final warning to mankind! Location of Revelation's seven churches! The Ephesians were gathered together, probably in some solitary spot upon the shore, to listen to Paul's address. This little company formed a singular contrast with the crowds which used to assemble at the times of public amusement in the theater of Miletus. But that vast theater is now a silent ruin, while the words and warning spoken by a careworn traveler like Paul to a few despised strangers are still living as they were that day. The apostle's words have been recorded in the Bible to teach lessons for all time, and to make known eternal truths to all who will hear them. While they reveal Paul's affection toward those he taught, they also reveal his ongoing concerns for the church and a warning to all Christians, at all times, to beware of divisions and teachers pursuing their own selfish gains. You know how, from the first day I came to Asia, and all the time I was with you, I served the Lord with all humility and with many tears and temptations . . . And how I did not keep back anything that was profitable, but preached to you (the church), and taught you publicly and from house to house . . .
Take heed therefore to yourselves and to all the flock, among which the Holy Spirit has made you overseers, to feed the church of God, which He purchased with His own blood. For I know this: that after my departure grievous wolves will come in among you, not sparing the flock; And from among your own selves men will rise up speaking perverse things to draw away disciples after themselves. Watch, therefore, remembering that for three years I ceased not to admonish each one night and day with tears (Acts 20:18 - 20, 28 - 31, HBFV). The close of Paul's warning was followed by a solemn act of united supplication (Acts 20:36). Apostle Paul knelt down on the shore with all those who had listened to him, and offered up a prayer to that God who was founding His Church in the midst of difficulties apparently insuperable. Paul's warning and prayer was then followed up an outbreak of natural grief, which even Christian faith and resignation were not able to restrain. They fell on the Apostle's neck and clung to him, and kissed him again and again, sorrowing most because of his own foreboding announcement that they should never behold he countenance again (Acts 20:38). But no long time could be devoted to the grief of separation. The wind was fair, and the vessel must depart. Those from the church at Ephesus accompanied the Apostle Paul to the edge of the water. With his warning still resonating in their hearts, they bid him farewell and watched his ship sail out into the open sea. How to spot false prophets! What is true Christian leadership? Why does God hate the Nicolaitans?